Driving a car in the best conditions takes an extreme amount of care and caution, but the winter months bring a whole new element to safety. The colder weather, sometimes including snow and ice, can make driving on the roads a lot harder and if your car is not up to scratch your safety, your passengers’ safety and that of others around you, can be put at risk. After you’ve checked the regular items such as battery, brakes, wipers and heating systems, what else needs to be done heading into the Tassie winter? Check your windscreen - Inspect your car’s windscreen carefully for cracks or chips. In icy conditions, the windshield glass can become very cold and any cracks can spread further or even shatter your windscreen altogether. Getting the tiny chips fixed before winter can prevent such a disaster occurring. Test your tyres - Did you know that if you turn your steering wheel to full hard lock you can check the wear on the tread of your tyres? 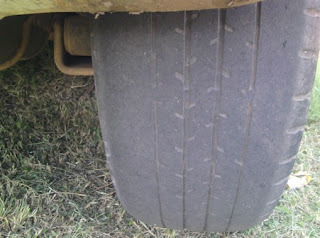 Doing this presents the full face of the tyres, which helps you to check the entire surface for baldness. Car tyres have wear indicators and shouldn't get to the point of ‘smooth’. If they do, you need to pay us a visit as a matter of urgency to avoid unsafe driving conditions. Prepare an emergency kit - Apart from your regular first aid kit, it’s important to have an emergency kit packed in case you become stranded with your car during the freezing winter months. Items to include are: a blanket, portable phone charger, extra drinking water, protein snack bars and a torch. These few things packed in the boot will ensure you and your passengers are kept warm, fed and watered in the event of an extended wait for help. If you need any assistance in making sure your vehicle is ready to face the harsh temperatures of winter, contact one of the Cooper Automotive Service Centres today.